◊ An item in the Toronto Star from 1936 explains a certain inscription on a tombstone found at the Pape Avenue Cemetery, Toronto’s oldest Jewish cemetery. 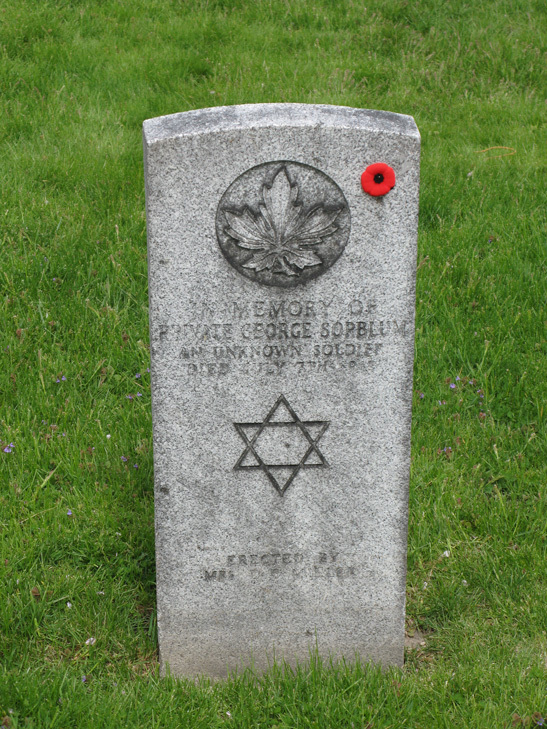 George Sorblum, Toronto’s “unknown soldier,” died in 1919 but his family only learned what happened to him in 2007. Some years ago a veteran presented himself at Christie Street hospital for treatment. He was a stranger, and before anything definite could be learned as to his family connections or whereabouts he died of his war wounds. All that was known was that he had served overseas and was Jewish. The Toronto Jewish branch, Canadian Legion, is holding an Armistice Day service at this grave tomorrow at 9 a.m. Cars leave 455 Manning Ave. at 8.15 a.m. for the Jewish cemetery, 317 Pape Avenue. There is a remarkable conclusion to this story, as told in the March 2007 issue of Shem Tov, the newsletter of the Jewish Genealogical Society of Toronto. The article “Finding Uncle George” by Carolyn Veffer recounts how a researcher in New York, Marla Cohen, had been searching for her great-uncle who “supposedly went north to find his fortune and was never heard from again.” Turns out that Sorblum died in Toronto and was buried here as the “unknown soldier,” far from his family or anyone who knew him. Members of JGS Toronto had posted his tombstone information on the Jewish Online Worldwide Burial Registry, the JewishGen site known as JOWBR, and Cohen had found the link. “My grandmother and her siblings related to me early on that they had an uncle, George, a younger brother, who (I assumed) came from the same town in Poland as my great-grandparents,” Cohen explained. “The story was that George simply disappeared when he left New York to go to Alaska to mine for gold. Now between you and me, that is a really good story! Really, how many Jewish boys went off to Alaska in pre-WWI America? “I had my doubts that he really existed. But fast-forward many years. Uncle George is a real person. 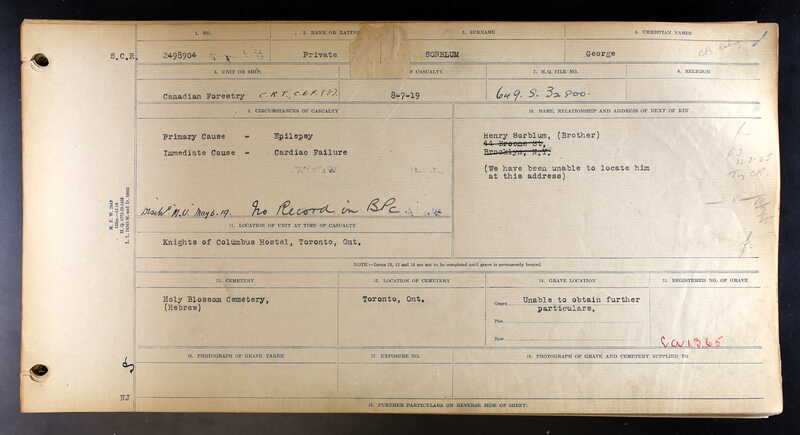 He appears on both the 1900 and 1910 census records, living first with one brother and then another one. After that, no more record of Uncle George. The mystery of Uncle George remained unsolved. But it began to bother me. Why couldn’t I find any trace of him? I checked the Alaskan census records, but nothing — until last week that is.